Following the stunning Kankyō Ongaku: Japanese Ambient, Environmental & New Age Music 1980-1990, Light in the Attic is delivering the next instalment in the label's Japan Archival Series. Focusing this time on Japan's City Pop genre, Pacific Breeze: Japanese City Pop, AOR & Boogie 1976-1986 will arrive on May 3. Like with Kankyō Ongaku and predecessor Even a Tree Can Shed Tears: Japanese Folk & Rock 1969-1973, most of the tracks of Pacific Breeze have never seen release outside Japan. Among the artists included are Yellow Magic Orchestra heroes Haruomi Hosono and Yukihiro Takahashi, as well as Hiroshi Sato, Shigeru Suzuki, Taeko Ohnuki, Minako Yoshida and Hitomi Tohyama, among others. LITA explains of the release: "Pacific Breeze is an expertly compiled collection of choice cuts that range from silky smooth grooves to innovative techno pop bangers and everything in between. Long-revered by crate diggers and adventurous music heads, this music has never been released outside of Japan until now." All music within has newly remastered audio, and in addition to s CD version, a 2-LP set will arrive on both black vinyl and "Beach Ball" tricolour wax. Both vinyl versions come with "a deluxe wide spine jacket with oversized fold-out booklet, full color printed inner sleeves, and custom die-cut obi card." There are also extensive liner notes and artist biographies courtesy of Andy Cabic (Vetiver), Zach Cowie (DJ & music supervisor) and Mark "Frosty" McNeill (dublab). 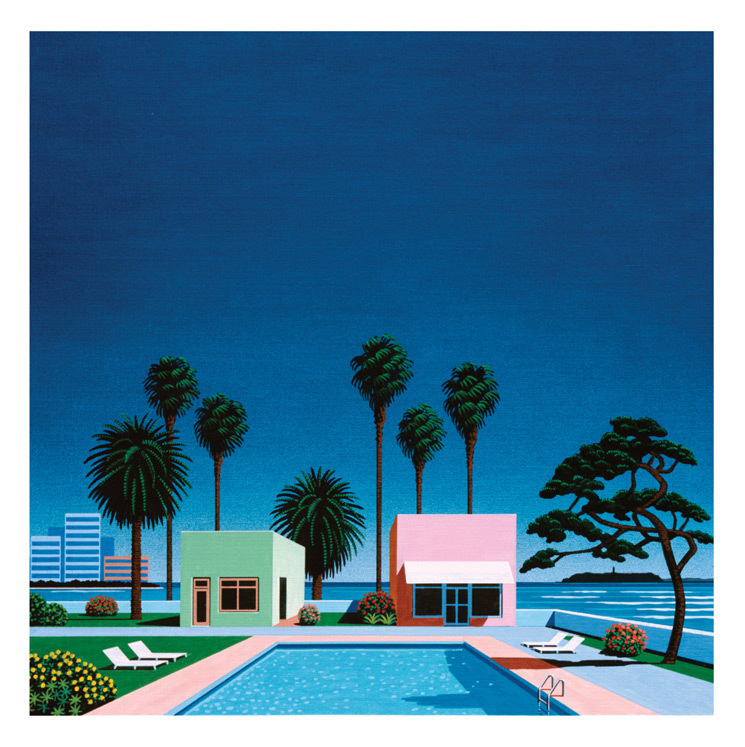 The comp comes featuring a newly commissioned cover painting by Tokyo-based artist Hiroshi Nagai, whose iconic images of resort living graced the covers of many classic City Pop albums back in the '80s. You can see that above, as well as the check out the deluxe coloured vinyl version below. You can pre-order the set over here now at LITA, which also has an exclusive bundle that includes a a 24"x 24" art print of Hiroshi Nagai's cover art and a deluxe full-color 30" x 60" beach towel featuring the same. You can also now sample the entire release now over on LITA's website. 1. Tomoko Soryo - "I Say Who"
2. Taeko Ohnuki - "Kusuri Wo Takusan"
3. Minako Yoshida - "Midnight Driver"
4. Nanako Sato - "Subterranean Futari Bocci"
5. Haruomi Hosono - "Sports Men"
6. Izumi Kobayashi - "Coffee Rumba"
7. F.O.E. - "In My Jungle"
8. Akira Inoue, Hiroshi Sato, Masataka Matsutoya - "Sun Bathing"
9. Hiroshi Sato - "Say Goodbye"
10. Yukihiro Takahashi - "Drip Dry Eyes"
11. Masayoshi Takanaka - "Bamboo Vender"
12. Shigeru Suzuki - "Lady Pink Panther"
13. Haruomi Hosono, Takahiko Ishikawa, Masataka Matsutoya - "Mykonos No Hanayome"
14. Yasuko Agawa - "L.A. Night"
15. Hitomi Tohyama - "Exotic Yokogao"
16. Tazumi Toyoshima - "Machibouke"